Welcome to Kumnooh (Khmer: art), a new weekly guide to the arts in Cambodia, a sister to the Leng Pleng music guide. Expect us in your inbox every Tuesday to alert you to openings, launches, readings, productions and screenings, across the range of visual, performance, literary and cinematic arts. We look forward to your support as we strive to bring together artists, venues and audiences. The week kicks off tonight at Romeet Gallery on St 178, with the opening of A Thing of Smoke, a collaboration between French Khmer visual artist Séra and American poet Julianne Sibiski described as “a dance between the artist and the poet”; ink, acrylic and pencil on Chinese paper. To accompany the show, Romeet has created a limited edition artist book in Khmer, French and English. Starts at 6 pm, and will run to 26 June. Wednesday night sees a launch at Meta House featuring the work of Phnom Penh based photographer John Vink. 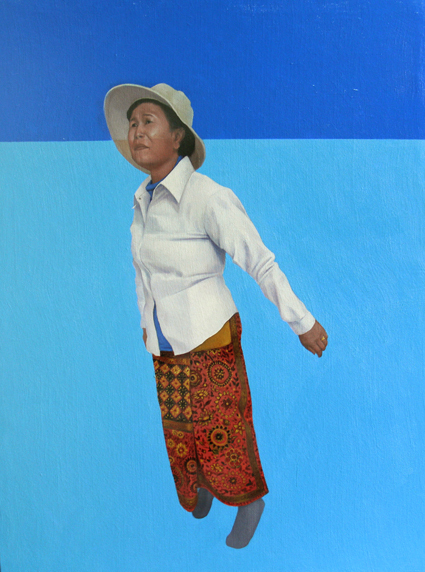 This exhibition marks the first anniversary of the iApp Quest for Land (available from iTunes), a work focusing on land grabbing and associated issues in Cambodia, with text provided by Robert Carmichael. Thirty of these photographs have been selected to be exhibited for the first time in Cambodia. Starts at 6 pm. On Thursday night Java Gallery & Café presents Surviving, the first solo exhibition by emerging Khmer artist Chov Theanly, paintings that hover between photo-realism and abstraction, using live models in abstract, uncertain environments, and drawing from such influences as Cambodian landscape artists, Russian social-realism and local sign painters. Starts at 6 pm, and the show will run through to July 7. Commencing Saturday night June 1st and running through to the Sunday 9th is the first film festival heritage to be held in Asia. The inaugural MEMORY! International Film Heritage Festival, organised by Bophana Center with the Technicolour Foundation for Cinema Heritage, takes the theme of dance, and will involve screenings at Chaktomuk Theatre, Bophana Center, workshops and lectures at the Institute français. The website is tantilising us with images of L’oiseau de Paradis, West Side Story and Singing in the Rain… but few details as yet. On a more interactive plane, the monthly Drink & Draw Cambodia session will be held this Sunday, 2nd June, from 5 pm to 7 pm at Baitong restaurant, #7, St 360. Featuring, as ever, a live model, air conditioning, drinks and nibbles. From 6 June to 2 July, Meta House is offering a free Short Fiction Writing Workshop, two x two hour sessions per week. Applications close Monday 3 June, get in quick with your 3-5 page writing sample and short bio. Classes will be in English, but preference will be given to writers of Khmer origin. Also this floated into our field of vision this week: theindochinaproject.com. They describe themselves as a crowd sourced collaborative on-line artwork, a project based in Vietnam seeking artistic/creative submissions from throughout the region in answer to the question What does Indochina mean to you? Entries close 10 June 2013. And finally, Phnom Penh based photographer Erika Piñeros talks to Proof: Media for Social Justice about her experiences of working in Cambodia. 20 Years of UNTAC: The Australian Embassy presents an exhibit of the work of Australian photographers from the UNTAC period, 1992-1993. Meta House, Sotheros Blvd. Until 6 June. Blood and Sand: photography by Erika Piñeros. Chinese House, Sisowath Quay. Until end of June. Sampot: The Collection of Small Things, by Chan Dany. Sa Sa Bassac, Sothereos Blvd. Until 23 July. Kumnooh (Khmer: art) is a new visual, literary, cinematic, performance and related contemporary arts guide for Phnom Penh, Siem Reap, and elsewhere in Cambodia. Kumnooh is conceived as a sister to the Leng Pleng mailing list and gig guide, which over the past four years has made a huge contribution to the growing strength of the music community in Cambodia, both expat and Khmer, bringing together artists, venues and audiences. If you are unfamiliar with Leng Pleng, check it here: www.lengpleng.com. The initial Kumnooh mailing list will be drawn from the resources of Leng Pleng and the Bong Thom classifieds website with appropriate opt-out provisions. *The web page is still a skeleton at this stage, but will be grown in the coming weeks. Your advice or input on areas not being covered will be appreciated. We hope you will help us in this effort to build stronger communications and networks within the visual, literary, cinematic, performance and related arts in Cambodia.